Chris Doheny’s debut solo release in 1994, ‘More Than A Game’, has since gone on to become an intrinsic part of football as the theme song for ‘The Footy Show’. It’s only fitting that its first verse is “Understand… There’s a fire that burns brightly inside you. Call to arms… You must stand and face your fate” because for Lado Alphonse and more than a dozen other young Sudanese-born Australians who call Cora Lynn their footballing home, Australia’s game is so much more than just a game. The Gazette first spoke with Lado in mid-2014, after he’d embarked on a sporting journey of a different kind – in the unique world of floorball. “Basically I had two different kinds of traditions and customs growing up,” he said at the time, of his childhood in both Sudan, and Uganda. Lado – along with seven of his family members – fled to Uganda, quite literally fearing for his life. “Uganda was safer, and you’d know it, because in Sudan you’d hear gunshots and by that time you’d know the distance and you’d know what to do,” he explained. Lado could vividly remember everything he witnessed, even as a young child. “I was very young, maybe eight or nine, but I still remember everything from back then,” he said. Since 2016, Lado has become a key figure to the Cobras and their make-up as an inclusive football and netball club. It’s not something that many would associate with the tiny country town that seems like it’s half a world away from everywhere. But for Lado and many of his young friends, and team mates, it really is half a world away from their war-torn upbringings. He spoke at Cora Lynn’s life members and sponsors function just prior to the senior football clash against local rival Kooweerup on Saturday night. The room was full of people hanging off his every word. “It has been very hard transitioning to adapt and survive here (in Melbourne’s south-east),” he admitted. Lado now works at a local school, with children with special needs. As a mature-age student, he’s also studying to be a teacher. 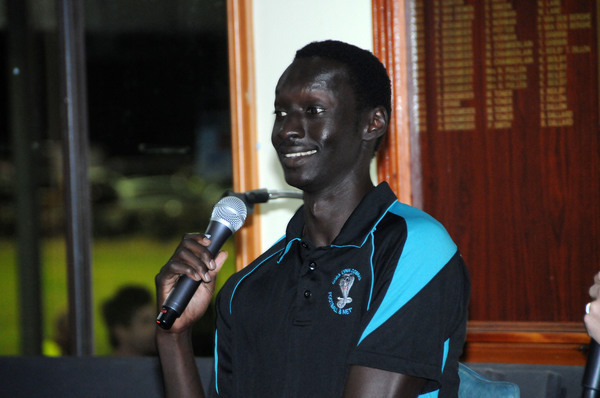 His involvement with the Cobras began through his link with club legend Michael Dillon, who has since made sure each of the club’s Sudanese-born players has been welcomed with open arms. But, in reality, the Cobras have done more than that. The club fully funds them – including their transport to and from games. But as Michael’s brother Terry – another club legend – explained, the Cobras have received “ten-fold” in return what they’ve committed to this incredible group of young men. “We wouldn’t have had one of our junior teams last year without them, and we’ve got far more positives from them than they have even from us in terms of what we’ve all learned through this process,” Terry said. Lado is realistic when it comes to his own footy ability. He even joked on Saturday night that most of the Sudanese youngsters at the club are much closer to their senior debuts than he is. But for all of them, footy is just so much more than a game. “Everyone is a vital piece of the club here,” he said, honestly. “No one really knows how they fit, but they know they’re needed. Recently, while watching a group of his mates having a kick at half-time of one of the Cobras’ senior games, Lado became quite emotional. “It was a surreal experience for me in that moment,” he said. “For anyone who’s been watching the news lately, people who look like me don’t tend to get the best of raps. Out here, I’m loved – but once I leave this place it can become a warzone. “There are some parts in the great city of Melbourne I still can’t walk in. People may not know that still happens, but that is my life. Lado thanked the Cobra community for their backing over his time at the club so far. “To everyone in this room – I just want to say thank you,” he said.